Coat oysters in hot sauce, then dredge them in seasoned flour. Flash fry at 375 degrees for 45 seconds to a minute. In a large bowl, whisk together mayonnaise, sour cream, chives, parsley, dill, garlic powder, onion powder, salt and pepper. Cover and refrigerate for 30 minutes before serving. Combine all ingredients in a pot and bring to a boil. Puree until desired thickness is reached. 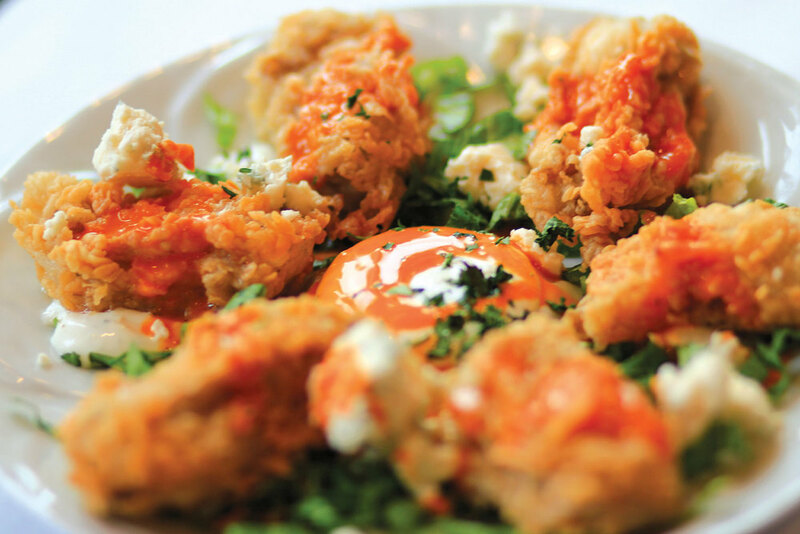 Serve on a chiffonade of Romaine lettuce, with a drizzle of ranch dressing atop the lettuce, the oysters arranged in the center and a drizzle of buffalo sauce over the oysters. Finish with crumbled blue cheese.